Shanghai - Two games, two defeats and no goals scored in the past week, but coach Marcello Lippi says his China side "have made gains". The Italian World Cup winner suffered his heaviest loss since taking charge of China in the 4-0 home drubbing to Colombia on Tuesday, four days after falling 2-0 to Serbia. It has been a chastening week for Lippi, who guided Italy to 2006 World Cup glory: on Monday his home country failed to qualify for the finals for the first time since 1958 after losing in a playoff to Sweden. Colombia and Serbia will both be in Russia for next year's World Cup but China will not and Lippi will instead spend next summer planning his side's preparations for their Asian Cup challenge in the UAE in January 2019. His side have plenty of work to do before then, and his priority would seem to be finding a goalscorer if he is to start making inroads on President Xi Jinping's stated aim of making China a football world power. Lippi recently complained that he was short of forwards because Chinese Super League (CSL) teams have invested heavily in buying foreign strikers such as Brazilian Hulk at Shanghai SIPG and the disappointing Argentine Carlos Tevez at Shanghai Shenhua. China created plenty of chances against Serbia, but they were wasteful in front of goal with Shanghai SIPG winger Wu Lei - leading Chinese scorer with 20 goals in the recently concluded CSL season - particularly profligate. Wu also squandered China's best chance on Tuesday when one-on-one with Colombia goalkeeper Jose Cuadrado. Sceptics pointed out that while China lost twice, World Cup qualifiers South Korea beat Colombia 2-1 last week and drew 1-1 with Serbia on Tuesday. "We were very close to scoring (against) Serbia and we created lots of opportunities in the second half as well," Lippi said following the Colombia defeat. "In today's game Wu Lei had a chance but unfortunately missed. But Wu has been performing very well lately, no matter whether it is in the league or with the national team. "I'm very satisfied with his performance. His effort on the pitch was clear to all and he always creates opportunities at key moments." 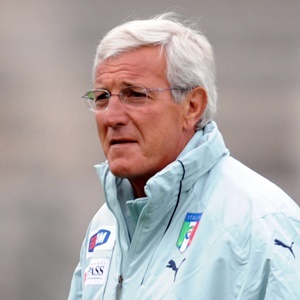 The 69-year-old Lippi said he could have hand picked easier opponents or instructed his team to sit back and defend against Serbia and Colombia, "but it is not meaningful for the team to practise. "Even though we lost this game, we have made gains and learnt from our loss so our players will understand that they need to keep their feet on the ground and keep working hard." Consensus among Chinese fans and experts is that the team - long regarded as a national embarrassment - are improving under Lippi and they have risen to 57th in the FIFA world rankings, their highest since 2004. Since taking over in October 2016, the Italian has presided over five wins, two draws and four defeats. He was unable to get China to the World Cup but their chances were already fading when he joined mid-qualification and with the exception of the defeat to a decent Colombia side, China do not easily ship goals. But they do not score them either. They netted just eight times in 10 games in the last qualifying round and Lippi badly needs someone to step up and take the heat off Wu. The influential Xinhua state news agency did not hold back on Wednesday, saying successive defeats proved there was still a "striking disparity" between China and their Asian rivals. Technically, Chinese players are "still a notch behind Japan and South Korea," it thundered in an opinion piece, saying the China were not good enough to even compete with "third-rate" European teams and their passing was too slow.